First off, congratulations to Ohio State. As badly as I wanted my boys in white and grey (should’ve been green and yellow) to come out and smother the Bucks, I can admit when we’ve been beaten. The verdict on whether it was actually the Buckeyes who beat us or us who beat us is still out. Either way, keep those heads up, Ducks fans. Last night does put a damper on our momentum, but it sure does not diminish the effort and the heart put into this year’s success. For a final time, here are some notes from last night’s game. 1. A loss does not make us losers. If anyone can tell me the last time a team and its fans felt disappointed after their team won a Rose Bowl and a Pac-12 Championship, I’d sure love to hear it. The list of accomplishments extends way beyond those two games though. Included in this year’s ride were a Heisman Trophy, revenge wins over rivals Stanford and Arizona, and memorable wins over top ranked powers UCLA and Michigan State. Marcus Mariota, as well as the entire senior class, should be lauded for their efforts. My head is not hung boys, but instead is held high. I could not be more proud of the team I represent, and the players I’ve cheered for all season. This team was about so much more than winning. It was about overcoming odds and learning how to handle adversity. It was about inspiring and encouraging young players everywhere, and that just because you were a 3-star prospect, that doesn’t mean you can’t achieve greatness. Most importantly, this team was about family. It was about not taking anything for granted, and simply living in the moment. From Saint Louis High School in HI, to that magical night in New York, this team was one with all Ducks everywhere. Once a Duck, always a Duck. 2. OSU beat us, but we sure helped them out. Mariota gave it his all. Mariota was, by all means of the word, spectacular in this game. He made enormous plays time after time again, escaping pressure and avoiding costly turnovers. In fact, he didn’t even turn over the ball. I refuse to count the INT at the end of the game. That one shouldn’t even be recorded. A 65% completion rate, 372 total yards of offense, and two touchdowns is nothing to hang his head about. All of those numbers could be improved if it weren’t for untimely and uncharacteristic drops by his receiving corp, too. The guy played his heart out, the Ducks just didn’t have it last night. 4. Ezekiel Elliott and Cardale Jones beat the Ducks at their own game. 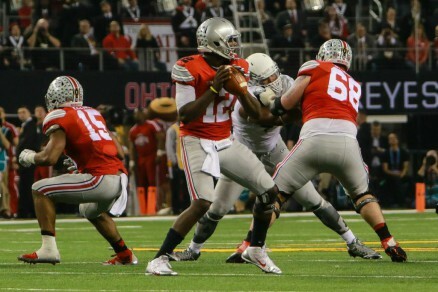 Cardale Jones didn’t look like a third string QB Monday night. 5. Questions now turn to the offseason. Now that it’s finally over, we have to ask: is it finally over? Does Mariota leave this year? Many experts think yes. Personally I believe he’d be an idiot not to, no matter how badly I wish he would stay. And if he goes, who’s next? Jeff Lockie? Morgan Mahalak? A freshman? What about the defense? Who will fill in for Tony Washington, Derrick Malone, Erick Dargan, Troy Hill and Ifo Ekpre-Olomu? Same goes for the offensive line. The draft, along with losing graduating seniors, should hit the Ducks hard next season. Now that’s not to say the Ducks don’t have the coaching and the talent to be back next year better than ever, but it does leave one final question: Who will be the next men up?